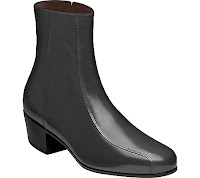 These Florsheim quality dress boots are on the best sellers list. The shiny appearance is given by the leather from which they are made: kidskin. The outsole is also made from leather. They are perfect for men that have a thin and long foot. Wear these dress boots at high-level business meetings or to a wedding. I bet everyone will think that you made a smart decision.